This story is not true, but similar experiences are probable! It's based in WW2 Belgium. Ava was 15 years old. She lived with her mother and father. They looked like a pretty normal, ordinary family, but they were not normal. They were not ordinary. They were illegal. They were hiding Jews in their house. And if they were found out, it meant almost certain death. Ava lived on a farm in Belgium. She was a typical country girl and she loved the country and felt happy. But when the Germans invaded Holland, things changed. For a while, everything was fine. She felt far away from everything, and she heard that things were relatively normal in the cities too. But then the Nazis started persecuting Jews. Things got worse and worse until the entire Jewish population was in danger, and many had no choice but to go into hiding. Ava’s family gave refuge to a family of 4. Then Ava found herself in a dangerous position. 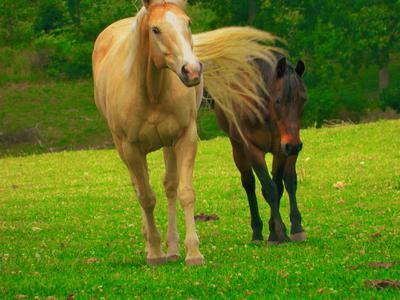 Ava had a beautiful palomino horse, Priceless Joy, and a bay, Autumn. She had got them for her 9th birthday, and they went everywhere together. She loved them and they loved her. As the Nazis were not nearby yet, she sometimes let Karina and Eric ride on them. And she sometimes took one of them behind her, as she rode. Karina and Eric were good at riding. They said they lived in a farm in Germany before, and escaped to Belgium in 1937. Then they could not get out again. And that's when Ava and her family came in. 1 year came and went. And by then, the Krey family was in hiding. They could not go out. It was too dangerous. Then the Nazis made an abandoned farmhouse nearby their quarters. Ava and her family decided it was too dangerous for them to stay here anymore. They had to go. But where? Things were desperate. They finally decided they would have to cross the border into Switzerland. But how? Ava saw a strange look on her parent’s faces. She squeezed Karina and Eric’s hands, each beside her. Her parents looked at her. They had a questioning look. Ava didn’t know what to say. She was overcome with emotion. She left the house and went to the stables. Then she hugged Priceless Joy and Autumn, and cried as if her heart would break. Ava didn’t know what to do. She heard footsteps behind her. It was Eric. He hugged her. Then he stroked Autumn and Priceless Joy. The day came when they left. Eric kissed all of them goodbye, and held Ava’s hands in his. “You’ll see them again, I promise.” He whispered. It was night. They silently left, with Karina and her mother on horseback. They would swap with Karina's father and Eric, later. A trusted friend of Ava’s father was leading them to the border. And they were gone. Ava thought of Priceless Joy and Autumn in bed. They were heroic horses. The look in their eyes told Ava they knew what they were doing. The Key family could trust them to be silent. Priceless Joy and Autumn. How she missed them. Please comment if you like it and want me to continue! It was August 1944. Ava was still missing Priceless Joy and Autumn Bay. And she was still missing Eric and Karina and heir parents. She knew they were safe. But they were not with her! She was now 17 years old. And she felt that everyday was torture. Everyday she saw them in her mind. Everyday they haunted her. She remembered the rides she had on Priceless and Autumn. How amazing it felt to be on top of a horse. How it was the best thing in the world. And, back to the present, how it had been taken away from her. Or rather, she had taken it away from herself. But she persisted in believing she had done the right thing. She KNEW she had. It was definitely right, but that didn't make her feel much better. That ache in her heart wouldn't go away. Things were getting better now. It was September, and Ava had heard on the radio that the Allies had arrived in Brussels on the 4th. Hope fluttered in her heart. Autumn! Priceless! She would see them again! Soon! It was too good to be true! And Eric and his family! It was December... almost Christmas. And yes, things were getting better. Belgium was getting liberated. But the Krey family wasn't taking any risks. They were waiting till the full, complete liberation. And they wouldn't be here for Christmas. "Ava! Come on, dear. Have you forgotten the cookies? They will burn! Its not daydreaming time!" Her aunt Carol told her. None of their family relations knew about the Krey family. "Oh yes, aunt Carol. I forgot." Ava went to take out the cookies. Christmas music played in the background. The children danced. Yet nothing stirred in her heart. She kept a frozen, fake smile plastered on her face all the time. The family went out to the barn. Father told the Christmas story. When it got to the part of "Peace on Earth, goodwill to men" that did it. Ava looked around her, trying to believe Priceless and Autumn were there. They weren't. And she thought the world was hardly peaceful right now. There was war. She wanted to cry, but she didn't. When they were all inside, Ava went to her bedroom and sobbed. How long would it be until the full, complete liberation? It was oh so hard. Sorry I haven't been posting for a while, I am really busy! But hang in there... I'll finish the story, I promise! Glad you all like it. Snd am I the only UK person here? I think I am - LOL. Please continue. I can't wait to see what happens next! Thanks for the update, it's awesome! "What do you think about Switzerland, dear?" Ava was about to squeal with delight at their luck, when she saw Eric staring at her, mouthing the words ‘be quiet." "Well, dear, I would very much like to go back. Germany is ruined and I do not want to go back." "What would have happened if Switzerland had not been there, I do not know." "I do not like to think about it. Switzerland saved us in many ways." "It has beautiful mountains, rivers, lakes! Valleys….. It is a wonderful place." "Well, do you want to go back?" "I do. But the children… What do you think they think?" "I’m sure they’d love to go back. But.. They’d sure miss Ava." At this, Ava paled. She hadn’t realised that if they went back they’d be leaving her behind. She didn’t want to be without Eric and Karina again. She blinked back tears. Eric looked at her. He grabbed hold of her hand and took her to the stable where they could talk and the adults wouldn’t hear. "You’re seriously thinking that’s it? That’s all?" He couldn’t help chuckling. "You are such a silly. Well at least we know know what they think, so my whole family is ready to go. "But…… maybe we can go with you and your family! That is also part of my plan. Of course we wouldn’t leave you and your parents behind." "Oh! I’m so glad!" Ava smiled. The horses nuzzled her. She stroked them. "Yes, and if we go, I’m taking you guys with me! I’m not going to let you horses go again. That was an emergency but I don’t think there will be any more. Right, Autumn? Right, Priceless?" She spoke to the horses. The horses whinnied as if to say, right. Ava laughed. "Eric, can we finish this tomorrow night? I’m exhausted and I do not want you glaring or mouthing shut up at me for yawning, since I can’t help it." She glared at him playfully. Eric laughed. "O.K! I guess you’re right. Thanks for helping, though I do hope you won’t giggle or yawn again tomorrow night." "Of course I won’t, if you just let me go to bed and get my sleep. I know someone who should also be getting his sleep." Ava smiled cheekily. "Hey! You can’t say anything! Well, O.K. Goodnight Ava." This is a really amazing story! The idea is so cool. And you're an awesome writer! After breakfast, Eric came to her shyly and looked at her intently for a moment. "Um, Ava, do you-would you like to go on a.. um, hack with me?" He said. "Why, of course, Eric. I can't wait to be on a horse again! For the first time after so many months!" "I can't imagine how happy you must be." "I'm over the moon. I'm so happy there's finally peace. War is horrible." "It is. If it wasn't for you and your family, we might have....." he said, and stopped abruptly. "Well," Ava said, changing the subject, "We should get the horses ready if we want to go on that hack!" she smiled nervously. Ava came to the horses and let them nuzzle her. " Which do you want, Eric? Priceless or Autumn?" she asked. "I'll have, um, Autumn." he said. Ava and Eric tacked up the horses and put on their riding breeches and boots. Ava looked at Eric. She wondered why he had asked her out on a hack. Well, she would find out soon, she thought. Eric and Ava started on Ava's favourite trail, that lead up to a hill. They chatted as they rode. "Well, er, Ava, I'm sure you are wondering why I asked you to go on a hack with me. Well, I need your advice." "Well, I feel that Switzerland saved me. I want to go back. I don't care for Germany anymore. I don't want to go back to Germany! You see, I have grown to love Switzerland, and.. well, I just want to go back." "You and Karina really want to go back, don't you? She told me herself. Yes, boy! We're on our favourite trail!" she replied to Eric and talked to Priceless Joy as he grew excited. "Yes. Well, I was wondering if my parents felt the same. But I need your help." he said. Ava led the horses to the front of their house. There were hugs and tears as the families had a joyful reunion. They had become very close, during those years of the war. Ava smiled at Eric. She clung onto the horses she loved. She was so happy, she could burst! Ava trembled and hugged and stroked Priceless and Autumn again. How she had missed them. Ava's mother looked at her and the horses and smiled. She was so happy for her daughter, and she herself had missed the horses a lot too. They all went to the meadow and had a very happy picnic. With the horses, of course- Ava would not leave them for a second. She had always been a Christian, but it wasn't until now that she really believed. She looked up at the sky and breathed "Thank you God". Ava went to sleep that night-at the stable. Karina came with her. She was now 13 years old. "Ava, I am so happy we are together again. Priceless and Autumn are real heroes." "Tell me, Karina. How is it in Switzerland?" "Oh, it is a beautiful land, unspoiled by war. The mountains, the rivers and lakes, the valleys, everything is so beautiful! I want to live there one day. It is for me, the land that saved me. And everyone is so friendly! There was no war there. It was peaceful!" "Really? It sounds amazing. It makes me want to go there!" "Oh, I have my heart set on it. Maybe one day we can go together." Ava slept well and happily that night for the first time in many months. Ava was awakened by the song of birds that morning. She had a strange but happy feeling. She went and had breakfast, and by some coincidence, she found herself sitting next to Eric-again. She turned and realised Eric was looking at the fields with a faraway look in his face. She fiddled with her hair, wondering what was the matter. Karina and Eric looked... homesick?! Pretty cool story! You are so talented! Keep it up! Can't wait to see what happens next! 4th February 1945 seemed like any normal day. Ava was listening to the radio. Then she jumped and turned pale. "Ava! What's wrong?" her mother asked. "Oh ma, Belgium is fully liberated! There are no German soldiers in Belgium. Oh ma, Priceless Joy and Autumn can come here! Her mother turned pale. "Robert, they can come back." was all she could say. Ava's father turned the radio on. They heard the news. "Belgium is free, Lucie! We are liberated!" He hugged them both. "Its official.."
"We will send the Krey family a letter through Mark." "They should come her within a week." On the 10th, Ava was feeding the chickens on their front porch. Then she saw something in the distance. 4 people, 2 on horseback. She knew who they were. With a cry of joy, Ava ran towards them. Her mother and father went to the door and looked. They were speechless! "Its them! " cried Ava's father. Ava slowed down when she got to them. She knew they would understand when she hardly said a word to them, and instead went straight to the horses. She sobbed uncontrollably. She stroked them, and they nuzzled her. It was a moment of pure joyful reunion. "Have I missed you, boys! Yes, yes!" she cried, as she was lost in them. Without leaving them, Ava said "Welcome home!" to the Kreys. They all hugged her, but she did not leave the horses for a second. Eric looked deep into her eyes. "I told you you would see them again!" he smiled. "I can't tell how I've missed you all. " Come, come." she said, with a joy she could not express. Thanks Sara, part 3 coming soon! You are an amazing writer! I loved this and keep it up please!